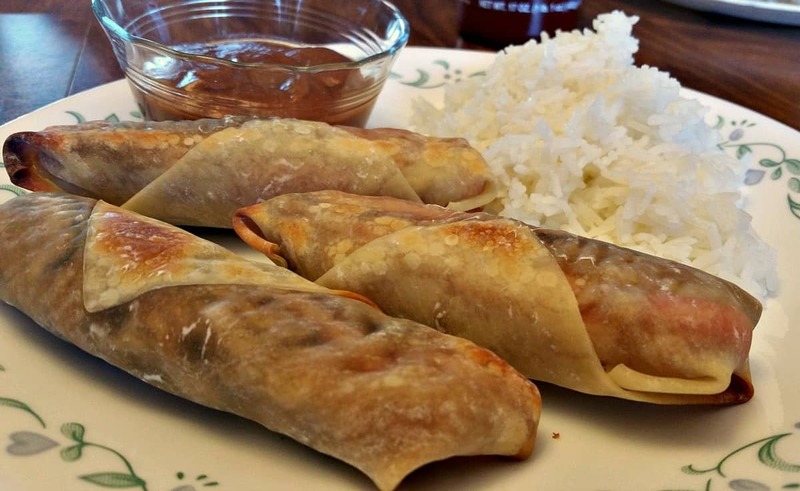 It was Oriental night at the Underwood household as I made some fresh homemade Baked Veggie Spring Rolls and served them up with some yummy white sticky rice. Egg Rolls? Spring Rolls? Summer Rolls? Veggie Rolls? Let’s just say they were veggie filled little wraps that I baked instead of deep-fried. Call them what you want. And with my spicy Thai Peanut Sauce – they were awesome. All rolled up together in a handy little pastry vehicle – made just for dipping…. 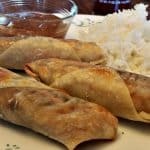 These Baked Veggie Spring Rolls are fairly easy to make, use whole fresh vegetable ingredients, and contain no oil or fat whatsoever. So they’re perfect for those nights you want a little healthy finger food. The hardest part is finding the right wrapper. Egg roll wrappers are usually made with eggs, so are not Vegan. And (as so many of you have pointed out) many Spring Roll Wrappers are made with oil, which are not McDougall friendly. All I can say is there ARE options out there – like these brown rice wrappers I found on Amazon. No oil, gluten free yada yada yada. And yes – that’s an affiliate link – meaning if you buy any from Amazon, I’ll make a penny or two. Of course if you REALLY want to control what’s in your wrapper – you can make your own – as there are many YouTube Videos showing you how with just flour, corn starch, salt, and water. Note: Rice wrappers may behave a little different that Spring Roll Wrappers. I believe you need to submerge the whole thing in warm water first to make them pliable – make sure you read the instructions. Now – on to the filling. I used a wok – but no worries if you don’t have one – any large pan will do. Saute 2-3 cloves of minced garlic and a good-sized hunk of minced ginger (about as big as the tip of your thumb) in 2 tablespoons of soy sauce. Now add in about a cup of chops leeks (or green onion), 2 tablespoons of rice vinegar, 1 1/2 tsp of chile garlic paste, and 80z of sliced Shiitake Mushrooms. Simmer this on medium heat until the veggies start to soften. Now add about half a head of shredded Savoy Cabbage, 1 carrot cut into matchsticks, and 1 bell pepper cut into strips, and toss. I used 2 wooden paddles to make it easier. Just toss things around until they heat through and start to wilt a bit. 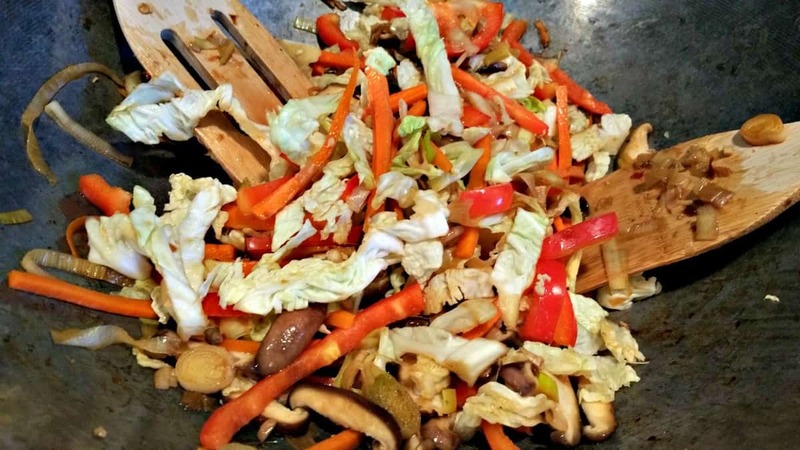 Once the veggies were done – I placed them in a bowl and slid them into the fridge to cool a bit while I prepared my counter for the Spring Roll assembly. This recipe made about 15 Baked Veggie Spring Rolls so you’ll need a cookie sheet large enough to hold all of them. Line it with a piece of parchment paper so there’s no sticking. Also get a coffee cup or something filled with water nearby – this is how you’ll seal your Spring Rolls. Preheat the oven to 425 and we’re ready to wrap. 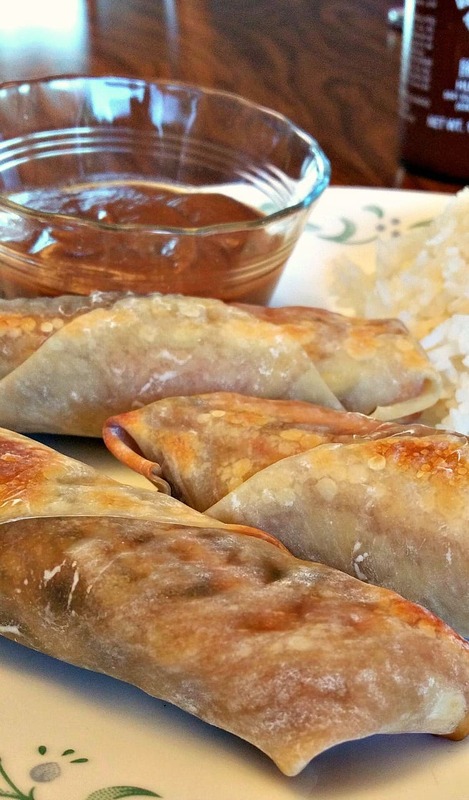 Place a Spring Roll Wrapper in front of you pointy side down – like a diamond. Place about 2 tablespoons of your filling right in the center and fold the bottom up over it. Now fold in the right side, and next the left, like you’re making a little envelope. Now give it a roll and when you have just a pointy tip left at the top, wet it down with water and roll to seal. One tip I learned the hard way – when you have long matchstick like veggies – like carrots – make sure they are aligned horizontally – otherwise when you go to roll them you’ll poke holes in your pastry. Repeat the process until you have 15 delicious, ready to bake – Spring Rolls. Bake in a 425 degree oven for 10 minutes. Afterwards, give them a flip and bake another 10 minutes or until golden brown. For the Spicy Peanut Sauce I simply used my sauce recipe for Thai Peanut Noodles. The Sauce starts off with equal parts Low Sodium Soy Sauce and water. To that I add lots of freshly chopped garlic, 1 tablespoon of rice vinegar, some ground ginger, and about 2-3 tablespoons of chunky peanut butter. The peanut butter will break apart so be sure and stir the sauce frequently over low heat until it’s nice and bubbly. And That as they say in the movies my friends….. The perfect healthy finger food - Baked Veggie Spring Rolls made from freshly shredded cabbage, slivered carrots, red bell peppers, and shiitake mushrooms. Add mushrooms, rice vinegar, and chile paste and simmer until softened. Bring bottom of wrap up over filling to seal in veggies. Fold Left and Right sides over and press to seal. Gently roll up until last pointed side of wrap remains. Wet last point with water and finish rolling to seal. Was it really only 2 tablespoons that you put in each wrapper? It seems like not very much. 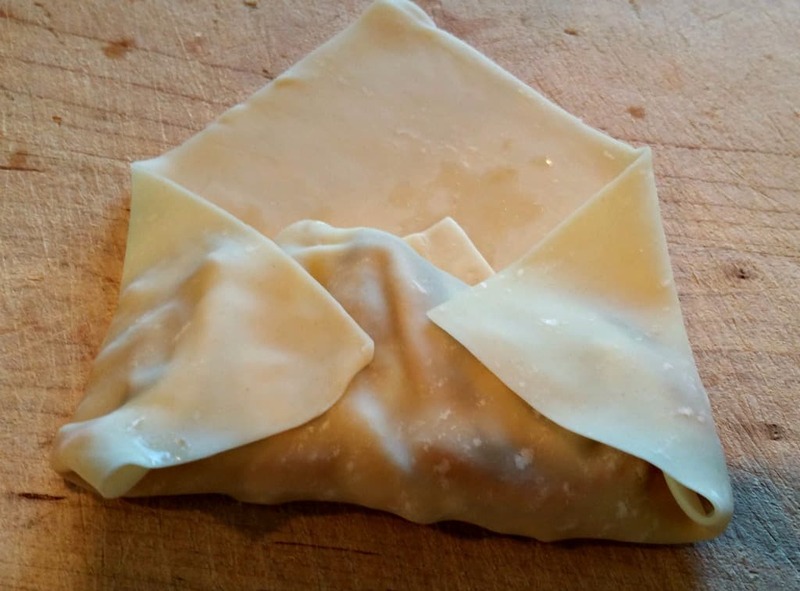 I suppose I’m missing something…the article shows a package of round spring roll wrappers and then the recipe states “with wrap in a diamond shape- pointed side down…”. How does a round wrap get diamond shaped? Does the rice paper get crispy after baking? Every other recipe for baking calls for basting with nasty oil to make it crispy, but I don’t keep it in the house. I want to make these for a party and won’t get a chance to try them first, so curious about the texture… not rubbery? Thanks so much, I will definitely give them a go! Looks delicious. Any tips of the best/healthiest chili garlic paste to use? I buy the one with the Rooster on it…. Huy Fong Chili Garlic Sauce. I just added it to my SHOP. I can’t find a link for the wrappers on Amazon. Are they still available? Thanks.